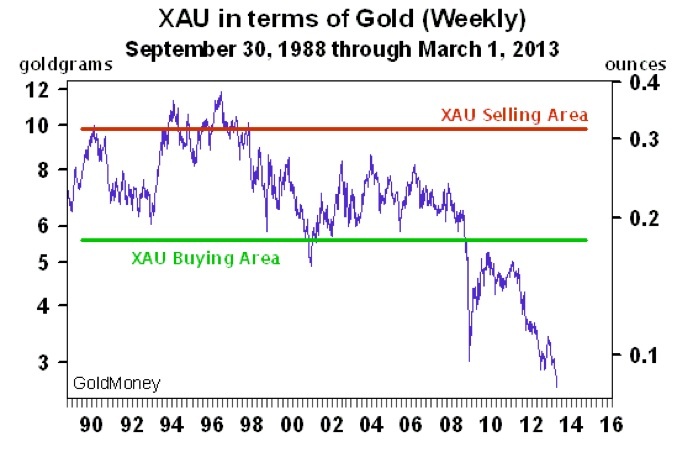 The following excellent chart from James Turk shows the largest gold mining index, the XAU, priced in gold going back decades. It shows the relative over or undervaluation of the mining stocks relative to the commodity that they produce and sell. It would seem as if the price of gold rising or falling in general would provide a similar, stable change to the companies that mine it. What we have seen recently is the greatest divergence in history. While physical gold has trended sideways for close to two years, the price of mining shares have completely collapsed relative to gold. This chart goes through March 1, and March 4 (yesterday) gold was essentially flat while most stocks were down at least another 3%. Just incredible. When events like this occur you almost begin to wonder how much further gold stocks can fall relative to their basic fundamentals such as earnings? Many of the larger stocks pay a dividend, allowing investors to capture an income stream while they wait for stocks to recover. How much longer can the irrationality in the market persist? The answer, of course, is much longer, but anyone who does not believe that gold will completely collapse in price (what the miners have priced in) have to take a long look at the chart above. We, the public, are always the last to know but the gold market may be sending us a message that the dollar is just beginning to catch a bid considering the train wreck in motion in foreign economies. The action in equities and the dollar is signaling a movement of money to safer havens, and who knows, this may be giving the FED the cover to lighten up on their QE to infinity book. just my $.02. What are your thoughts on the possibility that the mining shares are leading the price of the actual metals lower, rather than them being undervalued relative to the metals? P.S. I have a hard time navigating your site. It makes my browser (IE 9) extremely slow. Its like there is some sort of script or ad bogging it down. That's certainly possible. 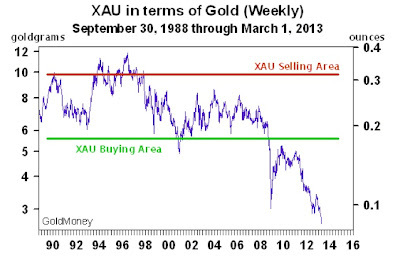 The "undervaluation" depends on where you anticipate gold to be in the months and years ahead. If you think the price of gold will collapse 40% to 50% over the next year (which could certainly happen) then the shares prices have it right and they are just leading the way. If you think gold will move sideways or even potentially move higher, then they are significantly undervalued and at some point will explode higher. I don't anticipate that much of a drop in the price of gold. I prefer to own the actual metals compared to the mining shares, but I would love to see that kind of move lower though for a great entry point. I wonder if they will meet somewhere in the middle.